Mark Development and Normandy officially filed its proposal for the Riverside Station project on Friday. The proposed transit-oriented mixed-use development consists of “ten buildings that are designed to maximize the principle of walkability on site and to create a vibrant, transit-oriented hub. These buildings would incorporate 611,437 square feet of office space, 675 residential units, 64,655 square feet of retail space, and a 194-key hotel keys.” More details about the project can be found here and a graphic explaining the Land Use process here. A TAB story is here. And here’s a video from a Land Use Committee meeting last month on the project’s concept plan. It is of critical importance that elected officials negotiate the best possible deal for the City of Newton with developers of large scale projects. In my opinion, for this Riverside project to be approved, the developer should designate 25% of the housing units as affordable, and offer the city a 10 year $O lease for school space. Elected “leaders” cannot be afraid to say “no” and withhold Special Permits when a proposal doesn’t work for the benefit of the city. The Riverside proposal is not dissimilar to the Northland proposal, in that they both combine lots of office space with massive amounts of housing. That combination can either benefit the city immensely, or ultimately prove disastrous. The outcome will be determined by the strength-of-will demonstrated by city officials during the permitting process. Like the Northland proposal, the enormous impact that this proposed development will have on all forms of transportation in this area, be it local and highway traffic, trains, busses, Commuter Rail and pedestrians, will be the key issues that will need to be negotiated in the months and years ahead. Since the issue of covering parts of the Mass Pike comes up very often in discussions of Newtonville developments: Auburndale village center would benefit very much from a similar “deck park”. There is at least a mile distance or a 20 minute walk between the Mass Pike and Auburndale village center. How would a deck park over the Pike impact Auburndale village center? I would consider Auburndale’s village center to be where the Knotty Pine etc are. Though I’m not 100% familiar with Auburndale so maybe others who live there consider another place the village center. It looks like on the map the center of Auburndale is the Pike so that is probably what Newtoner is referring to. @Elif, it is not correct that “if there is any adverse effect on the neighborhood, the City Council must deny the special permit,” nor that “[i]f there are adverse effects, the special permit must be denied.” The general rule is that to support denial of a special permit, an adverse impact must be “substantially more detrimental” to the neighborhood. For instance, the Massachusetts Supreme Judicial Court has held that the denial of a special permit based on an increase in traffic is not “substantial” may be overruled by a court as “arbitrary and capricious.” Shirley Wayside Ltd. P’ship v. Bd. of Appeals of Shirley, 461 Mass. 469 (2012). In addition, a special permit granting authority has the discretion to approve a special permit with reasonable conditions that will mitigate the adverse impact of a project on the neighborhood. It should also be noted that the special permit requirements for specific zones, e.g., MU3, may include other criteria that balance the benefits and adverse impacts of a project through required conditions. Finally, the courts give great deference to the exercise of discretion by special permit granting authorities, and generally uphold their decisions. @Newtoner, “deck parks” over the MassPike would be exorbitantly expensive, and provide very little in the way of mitigation. Tufts and various municipal and other partners studied that health affects of decking and the location of parks near highways. This study showed decking over highways provide only limited reductions in pollution, if any, and may actually increase adverse health impacts for highway commuters. The study also recommended that any park should be located a minimum of 7oo feet from a highway. So, deck parks should really be a non-starter. I’m referring to the shops on Auburn Street next to the Auburndale library, sitting right on top of the Pike. Not a very attractive shopping environment right now. I should add that the other thing that makes decking over the MassPike impracticable is that, in order to provide clearance for the railway and highway through most of Newton, the level of the deck itself would have to be constructed above the street grade. For instance, as you enter Star Market in Newtonville, you have to take an escalator up to the part of the grocery store that is suspended over the highway. So, a “deck park” would only be accessible by stairs, and fully ADA accessible by an elevator or a very, very long ramp. I would again raise the idea of working with the MBTA to activate the rail spur that connects Riverside with the Framingham/Worcester commuter rail line at Auburndale (or otherwise add Riverside to commuter rail). Such a project would be transformative for Newton. Rather than put up with a slow and an increasingly crowded Green Line inbound to Boston, some commuters could actually ride outbound to either work at Riverside or catch the commuter rail to Back Bay and South Station. Moving to subway-like service using DMU or EMU type trains would connect the existing commuter rail stations together to Riverside more like stops on existing subway lines (or like the old trolleys used to work). The rail right-of-way is there. The tracks are there. This connection needs to be a priority for Newton (pushing the MBTA and using leverage with developers) on par with improving our existing commuter rail stations. Michael Halle speaks the truth. @Mike: I actually prefer to open up that rail spur and make the connection more environmentally friendly by making it a walking/bike path. It’s less than a mile and very convenient. When I first moved to Newton, it was not a live track and people used to walk from Charles Street to get to the T. It was very pleasant. Amy, I see the appeal of that, and it should be part of a public discussion (I’m so grateful to the advocates of Newton who have helped raise attention about the rail spur, which by any standard is currently underused). However, I think those tracks are still considered active by the MBTA. They used them when the Green Line flooded at Kenmore Station. It’s one thing to reuse abandoned railroad rights of way. It’s another to decommission such a potentially valuable transit link. I don’t know the area well enough to know if rail and trail can co-exist. With direct access to 95, The Pike and the Riverside MBTA spot, MarkDev is asking for 675 rental units when Northland – whose property is landlocked – started their proposal at over 900?? And on a related note, what’s the ratio of content on this site that is favorable to dense development vs any content to the contrary? Seems like 20:1. I think the domain wrongsizenewton.com may still be available. Northland, Riverside… why MUST Newton areas transform from somewhat quiet residential to dense urban? Wouldn’t want to be the residential property owner near Riverside (seems that they should, if not legally than morally, be compensated for what is tantamount taking from their residential character). Newtoner. Oops. I meant to say there was a mile between Riverside and Auburndale village center. To follow up, if the full project is to be, while the picture looks pretty with the trees, the proposed development is parasitic of the beauty/open/foliage of the golf course across the street. Those proposed buildings look like very large footprints. AT THE VERY LEAST, allow for more green space along Grove Street (which would be much more heavily traveled). Let’s in the Garden City insist on aesthetics and open/park like feel (as mitigation) especially along roadways with such massive new development. The fact that Mark Development filed before Visioning is complete seriously undercuts the validity of the entire Process. And claiming that conversations “with various community members, including many from the Lower Falls and Auburndale neighborhoods” have informed their (Mark Development’s) proposal is bewildering. Residents from both neighborhoods are firmly opposed to the size and density of the project, which is unchanged since Mark Development shared it in October 2018, the first time the proposal was made public. Our land use approval process is so lengthy that it makes sense for developers to file as soon as they can. As with all projects of this scale (and as happened with Korf’s project at Washington Place) the proposal will change during the process. There’s plenty of opportunity for feedback and revisions. Where exactly is the open space? Connecting Riverside by rail to the Framingham/Worcester Commuter line would have greater environmental benefits than a walking path, especially if additional housing is built at Riverside. Transportation is MA #1 greenhouse gas emitter. Over 40% in 2016 according to the Sec. of Transportation today. The majority of emissions come from single occupancy vehicles, SUVs in particular. Growth in GHG emissions from transportation has surpassed reductions from more efficient buildings and clean/green electricity. Dense development and shared transportation (buses, trains, carpools) are the quickest way to reduce transportation’s GHG emissions in MA. This is a fantastic plan! A great mix of business and housing. The % of affordable units still be in considered. As a housing advocate, I support 25% which is economically feasible. As a strong fan of walking, as I have access to the Heron Trail along the Charles at the end of my street, what is being planned with this project is such an added benefit and asset for Lower Falls and Auburndale. It is so great that we have opportunities to do such great things here in Newton. When did we become a community where there desires of a few, outweigh the concerns of the many? FOR ONCE, I’d love to see something posted on V14 with some opposition to density other than in the comments section. Matt, you won’t see any opposition on V14 to this dense development. V14’s Greg Reibman is the head of the local Chamber of Commerce. Moreover, V14 liberalism will never feature a a thread in opposition to more subsidized, dense and cheaper housing aimed to foster socioeconomic diversity in the otherwise more prosperous residential Newton (existing residents be damned); the same way V14 will NEVER feature a thread about what is the biggest/most controversial/nationally watched and impacting public school case around the country (especially as it concerns antisemitism and anti-Israel bias) challenging Newton’s ultra PC educational curricula — Dechter et al. v. Newton School Committee, Fleishman et al. V14 only features the ultra PC liberal indoctrinating school system in glowing terms, NEVER the conservative perspective without extreme derision. @Jim, if it were purely political idealism, I’d be less annoyed. These developers are NOT offering “cheap, subsidized” (affordable) housing to the desired target audience – police, firefighters, teachers, nor others who work in public service here in Newton who can’t afford to live here. The percentages against average area median income only means their affordable housing will apply to those, “slightly less wealthy”. These parking spots that everyone has been debating about will have way more BMW and Lexus than Honda or Hyundai. It’s a joke. Instead, the motivation is purely driven by the mighty buck – for Big Development, and friends they’ve bought and paid for. While it has been said on occasion (if not regularly) that Village 14 is “not a news site”, it’s become a laughable abomination to the community friendly goals pontificated upon on the About (V14) page – at least when it has to do with Big Development. Hell, even the the post about Jeff Speck and walkability was sponsored by Mark Development – and while I did not watch the whole video, the first 10 mins or so was more about bike paths and sidewalks than the Washington St and Riverside developments. It’s one shameless plug after another. The Villages of Newton deserves better. Matt, I should have been clearer on ”subsidized, dense and cheaper housing aimed to foster socioeconomic diversity.” You are correct that in reality they are not cheap and affordable. That IS, however, how they are regularly presented here as the fake justification for the development. In Woburn, just off 128, the existing mall is being redeveloped. Perhaps the plans there are a good indication of what developers are able to do. Partnering with Avalon Bay for 400 units, 25% affordable and 70% to be provided to residents who are local – Woburn residents, municipal employees, and business owners. Riverside should reach at least this standard. I’ve always been under the impression that housing discrimination laws prevented renting/selling only to existing residents or people with local jobs, so I wonder how Woburn could have done this? I also don’t think it’s good public policy. Once you move here, you become local. Here is the link about this project in Woburn. @Lisa and @Greg – Newton’s inclusionary zoning policy does in fact stipulate a local preference for up to 70% of inclusionary units in a project. My understanding is that this preference is granted to current Newton residents, folks who currently work in the city or who have a confirmed job offer to work in the city, and folks who have one or more children already attending Newton public schools. Today’s [4/5] email update from Mayor Fuller which focused heavily on the Northland proposal, makes no mention of pushing the developer to increase the percentage of affordable housing units or provide the city with space to mitigate overcrowded classrooms. Fuller actually seems more like a cheerleader for the developer than an advocate for the city. Again, in my opinion city officials should be pushing heavily for more affordable housing units and classroom space. 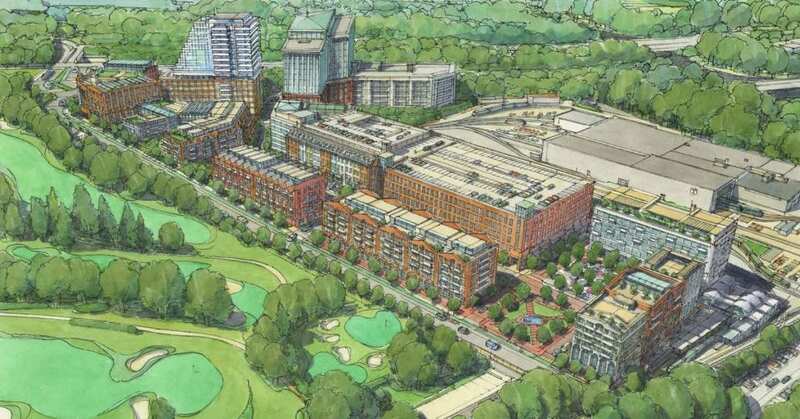 This is Newton’s largest development project in more than 50 years. Nearly 25 acres of developable property. The Fuller Administration and Land Use Committee are completely dropping the ball on negotiating the best possible deal for the City of Newton. Mike, yep, read the same thing. Mayor Fuller in these cases is nothing more than cheerleader and PR liaison for Newton developers. Mike, not disagreeing with the need to push the developers to include as much affordability as possible. But I do want to call out and emphasize that there have been many posts on this blog regarding how those affordable units are not really affordable. See Matt and Jim above. Allison corrected, but this keeps happening, and it is the argument I hear most frequently from my neighbors about the current Newtonville Developments. It is hard to have honest and difficult conversations on affordability and development if we are all just making up facts to fit our point of view. You can certainly argue that these AMI amounts are too high, or that the rental amount is still too high. I tend to view these units as modified “workforce” housing, more moderate income housing than low income housing. But they certainly allow folks who work for the city of Newton, the schools and the fire/police with young families, to live in Newton. Mike, I’m not a fan of the school proposal unless the City feels that is needed. I would be a fan of building slightly higher and including more green space. I wish they had done that in Newtonville. @Ted Hess-Mahan – The “substantially more detrimental” language was referred to in the case cited because it is in the Town of Shirley bylaw (of course not applicable in Newton) and a state statute, both of which concern expansion of a preexisting nonconforming structure or use (not an issue with the proposed Riverside development). I agree with fig about the need to clearly articulate what constitutes an “affordable” housing unit. My reference to that term is almost always based on the same criteria used under 40b. That statute requires 10% of a municipalities housing stock to meet its standard of affordability. At a minimum, projects built under 40b must designate 20% of their housing units as permanently affordable. The Northland proposal is not a 40b project. The developer needs lots of concessions from the city in order to build the project. City officials should therefore be holding them to a higher standard of affordability than 40b would. In my opinion. anything less than 25% of the proposed housing units being designated as permanently affordable should be a non-starter. The problem is, absolutely no one seems to be delivering that message to the developer on behalf of the city. @fig… I appreciate your comments. Not an unreasonable ask given they’re asking for 800 units – more than Avalon, more than Riverside. Fignewtonville, yes yes yes, it’s appalling and pathetic that more green space was not required in Newtonville, where the new development (especially on Austin Street) looks dense and crowded with no real setback. Awful and a missed opportunity. The City more than dropped the ball. @Elif, so I was chair of the Land Use Committee for four years, and a member for eight years, and I am a lawyer who does land use cases. You will have to trust me on this. Or not. But if you don’t, you would be wrong. @Matt Lai – The max rents for the affordable units are set by HUD, so I can tell you what they are without having to ask Northland. HUD sets the max rents based on the fact that a household should spend no more than 30% of their income on housing. The rents for the market rate will be, by definition, be what the market will bear, no? Allison, thank you! I was just going to track that down. 1) What is Adjusted Median Income, and the different levels at 80%,100% and 120%. This tells you WHO qualifies to rent at different levels based on income. 2) HUD rent levels based on a no more than 30% of income standards. This tells us HOW MUCH they’d have to pay. For those of you who say that these aren’t affordable units, they are not deep targeted affordable units. It is certainly possible to do that as a city, Boston for instance is raising taxes on hotels and lodging houses to pay for additional housing for homeless and formerly homeless individuals and families. While I’m sure the hotel industry isn’t thrilled, I think that is a terrific goal and those projects don’t work without major subsidy for obvious reasons (if a project doesn’t get any rent or modest rent, it can’t support much debt, so it relies on low income housing tax credits, HOME funds, CDBG and city sources to work). There are also plenty of projects geared towards 50% AMI and 60% AMI folks, but all of those use a combination of federal and state tax credits. There were multiple terrific developers (non-profit) who were interested in doing those types of projects for the Austin lot. Those credits are competitive in MA and the development timeframe would have been longer (especially if the law suit had delayed things like they did at Austin Street). With all that said about deep targeted units, there is still a great need for moderately affordable units. If anyone has checked out rents lately in the Boston/Newton area, one bedrooms are going for $2500 to $3000. In the luxury buildings it is going for $4000 or more. There would be a long waiting list for these units, and the limit of 30% of income for these rent levels is a good standard for affordability for workforce housing/moderately affordable housing. Newton struggles to create stand-alone affordability projects as the total costs per unit are so high due to land and construction costs. Matt, I hope this helps you understand the rent/income levels. You can certainly still object to them, but at least we will now have the same set of facts. How much new retail space does this town really need? Every development can’t be Assembly Row. Anything interesting that goes in here will leave a gap in the existing village centers that apparently only banks and salons will fill. If you were able to vote on this project, what would make you vote against or for it? It would appear you are running for a councilor at large position in the forth coming elections. Perhaps you could also explain what it would it take for you to vote No on this project… it would appear you would vote yes as it stands right now? The [Shirley] bylaw permits expansion of preexisting nonconforming uses if the landowner satisfies three conditions. First, the expansion of a nonconforming structure or use “shall not exceed twenty-five percent (25%) of its area on said lot” supporting that structure or use.4 § 2.8.4 of the bylaw. Second, the board must find “that such extension, alteration, reconstruction or repair ***is not substantially more detrimental to the neighborhood than the existing nonconforming structure or use***.”5 Id. Finally, the expansion “must be physically located within the perimeter of the lot as said perimeter existed and upon which the nonconforming structure or use was situated on the date the structure or use originally became nonconforming.” Id. The Court did not say that the *** language above is a “general standard” with respect to special permits (as is clear from the portion not quoted by you, which refers specifically to nonconforming structures or uses). What the Court said, in footnote 5, is that this “substantially more detrimental” language in the Shirley bylaw mirrors the standard set out in the statue concerning preexisting nonconforming structures (Mass Gen. Laws. c. 40A, § 6): “This requirement mirrors G.L. c. 40A, § 6, which authorizes local zoning boards to permit expansion of nonconforming structures or uses on a finding that ‘such change, extension or alteration shall not be substantially more detrimental than the existing nonconforming use to the neighborhood.’” Shirley Wayside, 461 Mass. at 473 n. 5. Chapter 40A, § 6 has nothing to do with special permit applications. Let’s wait for the public hearings and listen to the facts. @allison and @fig: these affordable housing numbers are better than than what I was led to believe or personally interpreted. Thank you for that. Had Northland confirmed these specific numbers as well. There have been many meetings and many decks presented. Your inputs above are clearer than anything I recall them previously presenting.